I enjoy finding a gift that I can make in bulk and share with family and friends at Christmastime. I have used my favorite hot cocoa recipe for years. (Recipe below.) Often I put it in a zip-loc bag and stick it in a gift bag and I have an instant gift for teachers, bus drivers, nieces, nephews. Especially if I’m giving a gift card, I like to also give something handmade or from the kitchen. The pen was a little hard to work with. As you can see, I experimented with a few different looks, but settled on the “scribble font” look as the most interesting. It’s a little “imperfect” for a perfectionist like me, but when you back away from it and squint your eyes, it passes! I also thought it would be fun to make some mug rugs. This was a little harder than I thought! I grabbed fabric scraps and started sewing them together. 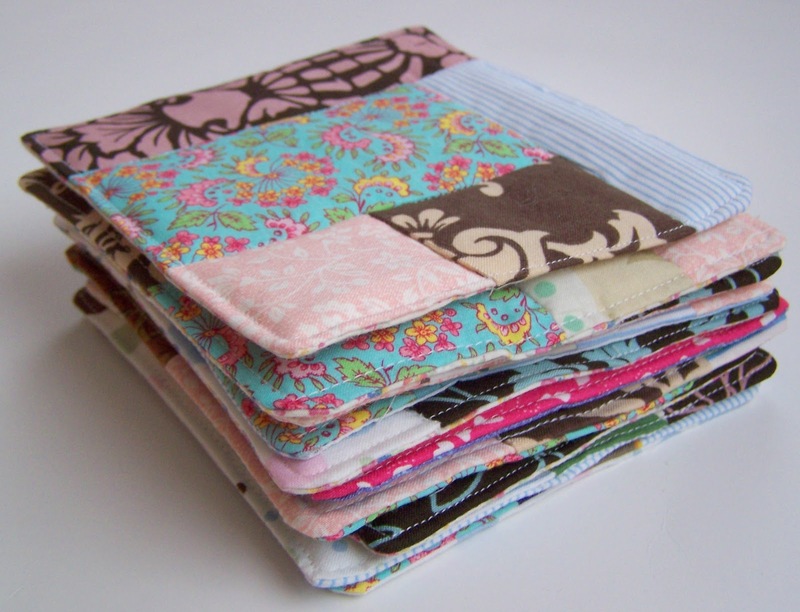 I cut them to 6″ squares, added a layer of batting and a backing fabric. I sewed them together, wrong sides facing, turned them inside out and stitched around the perimeter and in the ditches. 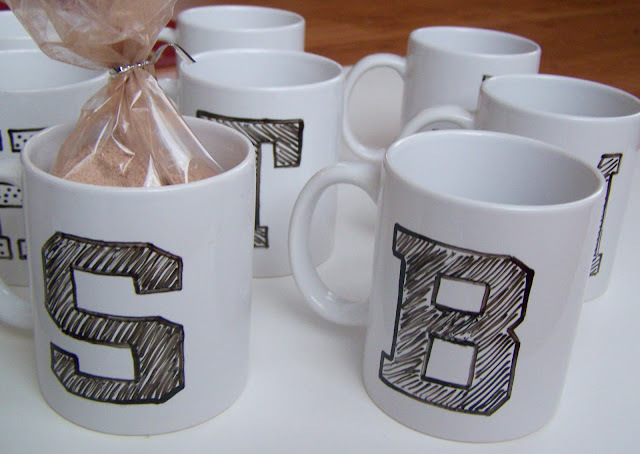 So a mug, mug rug and some hot cocoa tied together with a cute ribbon and gift tag (which I haven’t added yet) makes a nice little gift. Mix all ingredients and store in airtight container. To serve, mix 1/3 C cocoa mix in 1 C boiling water. Be sure to let the recipient know how much to use! 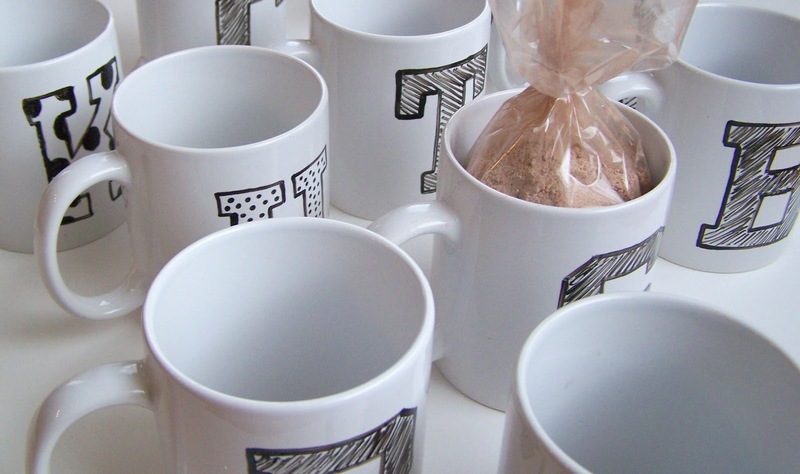 That’s a good idea adding something homemade from the kitchen to a gift card present. I’m impressed with your mugs– was it hard to learn how to do that? 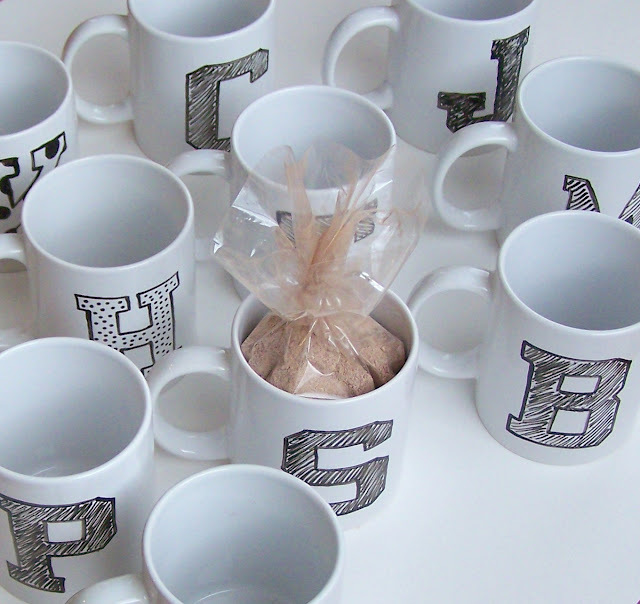 I know what you mean about being a perfectionist, but your mugs look really good! And the mug rugs are just so sweet, like little mini quilts. 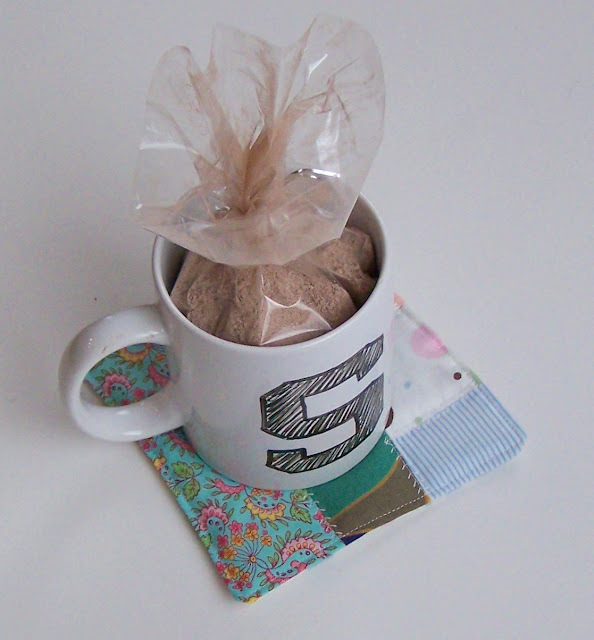 When I have a cold I crave hot chocolate, but have never tried to make it from scratch, only from an envelope! I mention that because I’m in bed with a cold today and there is an envelope of hot chocolate sent to me by a blogger friend waiting on the counter. Off I go! Hope you are having a great weekend, Jane. AWESOME…. can I steal that idea for teacher gifts next year??? ?